Delphinium (del-fin-ee-um) is a genus of about 300 species of perennial flowering plants in the buttercup family Ranunculaceae, native throughout the Northern Hemisphere and also on the high mountains of tropical Africa. The common name, Larkspur, usually refers to annual varieties. Many species are cultivated as garden plants and make stunning cut-flower arrangements. This garden classic bears spikes of intensely colored blossoms in shades of blue, purple, white, and pink. The largest varieties can reach 6 feet tall, with some are dwarf selections. Cut down spent blossoms for another flush of blooms. Delphiniums grow best in rich fertile, medium moisture, well-drained soil, with a basic pH and protection from wind. Add lime to acidic soil and fertilize regularly, preferably with compost or manure. When planting, be sure to set the crown at or above soil level to avoid rot. Delphiniums can be grown in partial shade, though full sun may help to prevent powdery mildew. 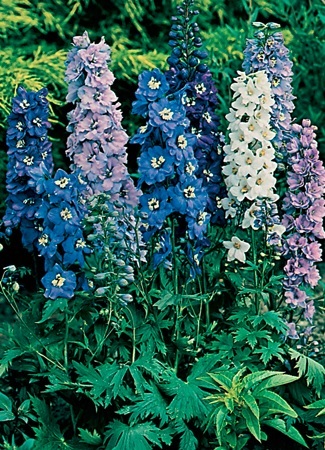 Since their stems are hollow, taller varieties of Delphiniums should be staked to prevent damage from wind and rain. These new hybrids tend to be longer lived than their short-lived cousins but may be propagated from basal cuttings. PLANTING: Set plants 18 to 24 inches apart. Cool conditions will encourage spikes to attain their maximum size; and choose a location in full sun, with a humus-rich, well-drained but moisture-retentive soil (ideally of neutral to slight alkaline reaction). Good drainage is essential; lighten soil with sand and compost, if necessary. Crowns should be placed 1 to 2 inches below the surface of the soil; deeper planting might lead to crown rot. MAINTENANCE: Delphiniums should be fed liberally with manure or a recommended fertilizer. After initial blooming, cut back blooming stalks to 6 inches above ground to promote a second bloom. Leaves must not be removed. Taller varieties, especially if exposed to wind, may require staking. We recommend winter mulch. To promote larger flowers and greater numbers, remove all but 5 young shoots, early in the season when they are 4 to 6 inches high. It is important to stake tall growing varieties and this is best done early in the season. Zones 3-7 (but can be treated as a hardy spring annual in Zones 8-10).